I haven't gotten very random lately and I thought now was a good time to do so. My mind has been a little bit in shambles with never ending events, travels, birthdays, holidays, winding down the school year, summer plans and prior obligations. Today is all about chatting girlfriend-to-girlfriend. There are a few things I wanted to admit to you guys, nothing too serious...just coffee talk., except for #5...this was something that hit me and thousands of others like a ton of bricks. 1. I have worn this stripe maxi dress twice in four days...with the same sandals, jacket and necklace. Sometimes outfits deserve to be on repeat. 2. I haven't cooked a meal in almost a week. We have been eating out as if every restaurant in town is shutting down. And because tonight (actually yesterday) starts the second round of NBA basketball playoffs, we are ordering pizza. Go Spurs Go! 3. My nails are in big, ginormous trouble. I got back-to-back shellac/gel manicures. I was bad, really bad and picked off the color myself (both times) instead of going to the salon. Now that my nails have been stripped a few layers, they are super brittle, thin, bumpy and crying for some TLC. I plan to go bare for awhile and hope that some of you ladies can recommend a nail repair polish that can whip them back into shape. 5. A fellow blogger lost her son last Friday in a tragic accident. After hearing about the story and scrolling through recent pictures of their family on Instagram, my heart fell to the floor and stayed there the rest of the day. Being a mom myself, I cannot even begin to fathom losing a child or comprehend what this couple and their family are going through right now. I do not know Jacqui, her husband or had the opportunity of personally meeting her gift from God, Ryan, but for some reason I feel strangely connected. Is it because I am a mom too? Or because she blogs? Or because her son had red hair like my youngest? With tears streaming down, I think it's all of the above, plus so much more. The blogging/social media world can be cruel at times, but I truly believe that 90% is it to do good and spread good. It's a platform where we can share cheer, positively engage, remorse together during tragedies, triumph in victories and most importantly, lift one another up in times of destitute. I shared this excruciatingly painful story on my social media channels yesterday. I called my mom crying. I couldn't contain myself when chatting with my husband. I squeezed and kissed my kids tighter and harder than I have in a long time. Seeing the posts on Instagram, Twitter and Facebook gave me relief. Relief that this one family's tragedy made thousands of people stop what they were doing to say a prayer, remind themselves of how lucky they are, let out a good cry and rallied to support a family in this big, gigantic world to let them know that we are all grieving, yet rejoicing for their little boy's life...people we haven't ever met. Ryan has already left a legacy. Stop and think about it. It's truly remarkable. Thank you to everyone who clicked on my posts that shared the donation page for Ryan. I believe those clicks equated to hundreds of prayers for a family that needed it now more than ever. *There a many shops and companies creating items in Ryan's name. If you decide to donate or purchase something, keep in mind the percentage of proceeds that will benefit the family. I love this outfit on you - I can see why you've worn it a few times. I recently get gel nails done and didn't realize the process it takes to remove it. I am never going to get it done again - it's so bad for your nails. I was in tears as well reading about the loss that Jacqui experienced. I just can't imagine losing your child. My heart is breaking as I saw the pictures of Ryan....I can't fathom the pain of losing a child & I want to reach out to Jacqui via that donation page. On a fashion note, I'm so into your look today Shanna....as I have been living in maxis on weekends! I feel so bad for Jaqui, that's just aweful. So happy everyone is coming together to help the family. Our hearts go out to Jaqui and her family. Praying that God holds that family in the palm of his hand during this time of grief. Thank you for sharing Shanna. I totally get what you are saying about all this. I was the same way when I heard the news and I didn't know her either, just a friend of hers. It's so heartbreaking. I felt myself tearing up as I bathed my youngest last night and squeezed them all extra tight. My oldest heard me talking to my husband about it and got really concerned and it was hard talking with her about it all. We said a prayer for peace and comfort for the family. It's tragic. You look fabulous, as always. 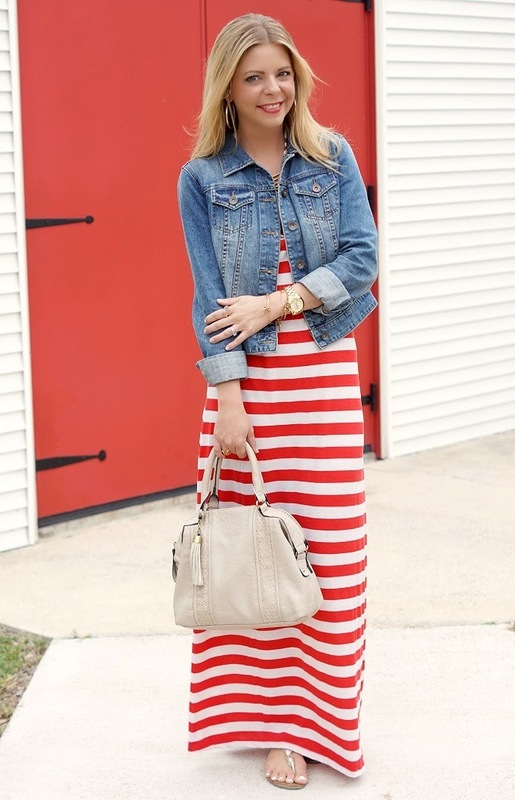 Love a maxi dress with denim jacket. My birthday is tomorrow. I can barely even talk about it. I had the same shellac-nail-wrecking-experience this winter. I haven't gotten one since!!! Ryan's story is so completely tragic and unthinkable. I was crying as well. Thanks so much for sharing Ryan's story. I'm not a mom yet, but I can't even imagine going through something like that. I know I'll be thinking of them all day. I saw this story on social media yesterday and it broke my heart. I can't even imagine the pain and heartbreak. Let's squeeze our kids tighter and pray for this family. So heartbroken for their family and this enormous loss - I cannot even imagine what they are going through. But it has been incredible to see the outpouring of support and it makes me realize what an amazing community we are a part of. I have had the heaviest of hearts since reading about this news yesterday, one cannot even fathom the emotions of losing a child. What a beautiful little boy. My prayers and thoughts are with the family, Shanna thank you for connecting me with a link to support this family during such a difficult time. Wow, this is very sobering. It's too painful to imagine losing a child. It must be beyond difficult. Thank you for sharing. Her and her family will be in my prayers. I do the same thing with outfits. Over and over! But when it's cute like this, it deserves to be worn multiple times in a week! I was so sad to hear about her son. It was amazing to see the support they were receiving. I hope that brings her a some kind of comfort. Sometimes I think things hit us so hard because we are in the same peer group and can put ourselves in the other person's shoes so well, and we lose it a little when we do that. I wish them comfort and peace. I truly can't imagine that loss. I have no hat in the ring for any NBA team, so wishing yours well! This is the second sweet family I've read about in the last couple of days who had to say goodbye to a child over the weekend. The Fish family lost their precious son, Teddy, to Menkes on Monday. My heart is just breaking for all of these parents today. So unimaginable. Thank you for sharing this story so that Jacqui can be lifted up during this dark time. Sweet Ryan was such a doll. Thank you for sharing about Jacqui's family. What a tragic story and definitely a good reminder for all of us to be extra grateful and appreciative of our loved ones! On the note about the nails, every time I remove polish (gel or regular) I rub coconut oil into my nails and it makes a huge difference! My heart is breaking for the family. Even though I just became a mom... I can't imagine my life without my little girl. It's so tragic. I hope the family is able to find peace. Ryan's story is so heartbreaking. My heart is hurting for your friend Shanna. Err yeah, I'm also guilty of #3. Like, every single time I get a gel mani. I use nailtiques (you can get it right at CVS) to strengthen my nails after I've inevitably peeled them. It's fabulous and definitely helps whip them back into shape! 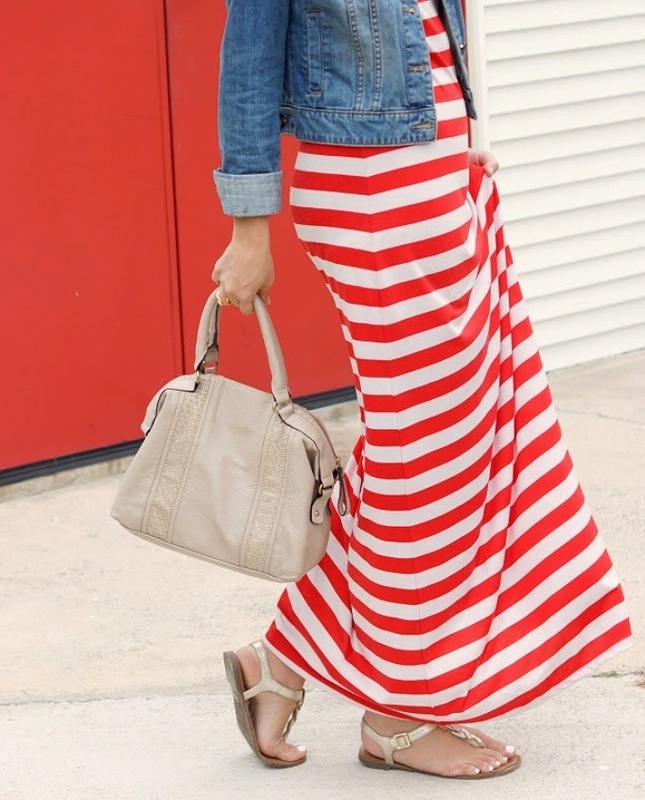 This striped maxi is just the cutest on you! I'd keep wearing it day after day too! I too am incredibly saddened for Jacqui and her family. Such a horrible tragedy. I hope the Red Balloons for Ryan campaign brings her a tiny bit of comfort. Oh my goodness, I don't even know the story or the blogger. I can't even imagine losing a child. I will keep their family in my prayers. Oh no, what a horrible horrible tragedy... that is so incredibly sad. I will keep her and her family in my prayers. I don't know Jacqui but I just read Ryan's story and I'm crying. So tragic and sad. On a lighter note, I love that outfit. In fact, yesterday I wore a black & white striped maxi with sandals and a white denim jacket. Great minds! I recently found your blog through Jennie's Six on Sunday, and I absolutely love it! I'm coveting all your style, with today's outfit as no exception. I heard about Ryan yesterday, too, and my heart just broke. I wasn't familiar with Jacqui's blog or their story, but it always is so tragic when a child dies. You're right - it really made me and I'm sure all of us take a minute and thank God for all the blessings, little and big, in our life. i am so saddened by this story. thank you for passing it along and helping out this family. Love this outfit. You are right when it is comfy and looks great deserves a repeat. The necklace looks awesome. Thanks for letting me link up!! I hosted my first link up this week and can you believe someone linked two posts and didn't subscribe to my blog or link back?? It's so rude! ha ha...anyway, great outfit. Love maxi dresses! They are so effortlessly chic! Can't wait to see more! My heart is breaking for Jacqui and her family. No words. I almost bought a striped maxi last week, but refrained bc I really needed shorts...not maxis. But, not I am regretting it! And tons of prayers are going up for that family. XO! As for the outfit...I can see why it's on repeat...VERY cute! That necklace just goes with it too perfectly! When I heard about Ryan on instagram and saw the pics of the family so happy together, Shanna I can't even explain the sadness I felt, so deep. You explained it very well, as a mom, human being, blogge,r I felt that connection as well and couldn't get the family out of my mind. We really need to cherish all the people we love right now, this moment, life is just way unpredictable. It made me very optimistic to see all the love and support pouring out for the family that there is much kindness in the world even in the challenging social media environment. I love that necklace! Can't believe it's from F21!!!! Ryan's story is so tragic, but his short days on Earth, I trust was full of light, joy, and love - you can just tell. Thinking of their family and sending my heart their way. Re: the nail situation: Try Butter London's strengthening nail products. They're available at Nordstrom or Beauty.com and they aren't cheap, but they work really, really well! 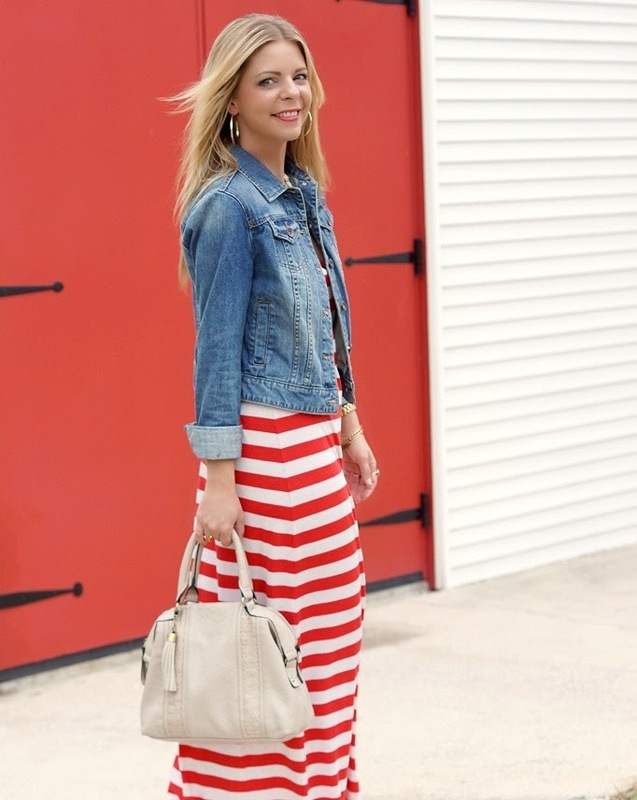 Love this look, want it for the 4th of July! I have been thinking of Ryan since yesterday and at times overwhelmed with sadness at the loss for his family. Loved your post today. I don't know Ryan's family but my heart goes out to them. As for the outfit, I really love your maxi dress and necklace! Such a great look. Very heartbreaking to hear about her son, I am praying for that family! 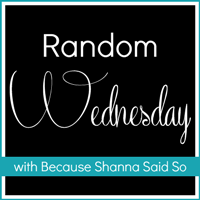 I love your 'random' post today! Okay so I had been following you for just a short time now and am just now realizing not only are you in Texas but Austin! (I think right?) OMG I live in San Antonio and have been on the hunt for local bloggers. I would love to possibly meet up one day, love your style & blog! I can see why you keep wearing this maxi! I absolutely love it on you!! It's such a heartbreaking story about Ryan, but I love how the blogging community has come together. I have been addicted to maxis lately and am wearing one to work today. Love the stripes! I heard about Ryan.. Praying for all of them. This dress!!! I love it so much! This outfit definitely deserves to be on repeat! And it's on the expensive side, but Londontown's nail care and nail lacquer collections are insanely good at repairing and strengthening nails! I love the base and topcoats, and I use their nail cream every night! First, this dress is amazing on you. Seriously one of my favorite all time looks of yours - so effortless! Second, I feel your pain about not understanding how the years have added up when we get one more year older! It's also quite depressing when everyone from sports personalities to strangers you meet for the first time are almost always consistently younger than me vs. older! Lastly, I love that the blogging community can come together with a vengeance for things like that. Definitely a time to feel gratitude and feel thankful. This outfit is so beautiful! :) Love the dress!